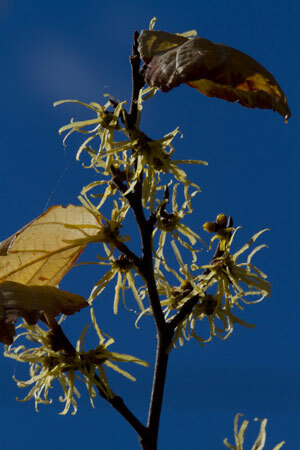 Witch hazel is rich in tannins making it a strong astringent. It can be taken both internally and externally to treat a variety of conditions involving infections, inflamed skin, and mucous membranes. Externally, witch hazel extracts are often applied to irritated and/or damaged skin including different forms of dermatitis (e.g. eczema, poison ivy). Applied to bleeding wounds and ulcers, witch hazel acts as a styptic to arrest bleeding and forms a protective barrier that promotes healing and prevents infection. It can reduce the pain and swelling in those suffering from engorged veins, like hemorrhoids and varicose veins. Research reveals it possess antiviral actions against several viruses including those that cause warts. Witch hazel is used internally to a lesser degree but has been historically used to treat infectious diarrhea and gastrointestinal ulcers. Because of the high tannin content internal use should be restricted for short periods of time because it can decrease the absorption of nutrients and drugs.